For any user who needs a small chunk of Ethernet connectivity, a 4-port "go anywhere" Magnum S14 Switch is a versatile and handy solution. It provides edge access Ethernet ports it in a convenient and compact package. Extra features for heavy-duty and extended temperature operation ranges are included selectively in the Hardened factory-floor and Premium-rated outdoor models. This three-level selection of models offers the best price-to-value for each user and installation. 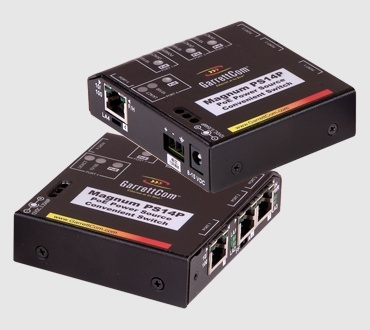 The Magnum PS14P Switch has four PoE-enabled RJ-45 ports that can drive 802.3af-compliant PDs as well as deliver 10/100 Mb data transmission over the same twisted-pair cable. The PS14P switches have an auto-sensing algorithm that cuts off power when 802.3af-compliant devices are not attached. Proprietary PoE and non-PoE equipment are not recognized, which protects them from possible damage. The PS14P switch supports the Power-over-Ethernet PSE standard for over-current protection, under-current detection, and fault protection. Compact - Offers four switch 10/100 RJ-45 ports, three in front, one in the rear in a small "go-anywhere" package. Power Flexibility - Available with 12, 24, -48V DC as well as AC Power. Hardened - Models available for both industrial (factory floor) and outdoor (temperature-uncontrolled environments). Mounting Flexibility - May be DIN-Rail, panel mounted or fit into Magnum MC14-TRAY. View the entire GarrettCom portfolio and all technical product information. 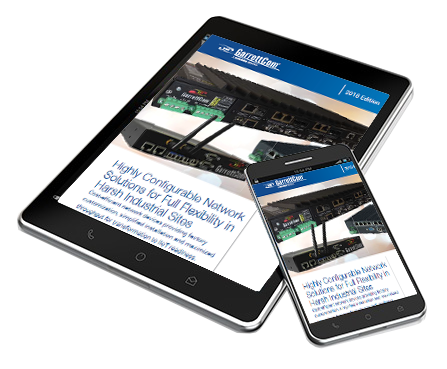 Download the GarrettCom Product Selection Guide for in-depth product information. View the entire portfolio and technical product information.